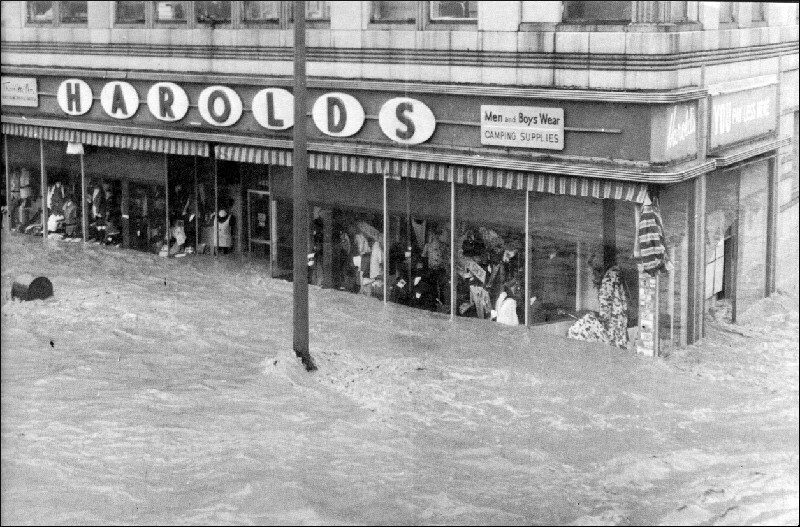 In late June 1972, Hurricane Agnes caused some of the most devastating flooding the Northeast has experienced. The track and strength of Agnes. Credit: National Hurricane Center. Agnes formed over Mexico’s Yucatan Peninsula on June 14, became a tropical storm in the Caribbean Sea on June 16, and made landfall along the Florida Panhandle as a Category 1 hurricane on June 19. The system weakened as it crossed Georgia but regained strength as it moved across eastern North Carolina then into the Atlantic Ocean on June 21. Agnes made landfall as a strong tropical storm near New York City on June 22 and merged with another low on June 23. The system affected the region through June 25. Rainfall totals from Agnes. Credit: NOAA Weather Prediction Center. Parts of the Northeast had already experienced wetter-than-normal conditions prior to Agnes’ arrival, so soils were saturated and stream flow was high. The system dumped up to 19 inches of rain on the region. The already wet conditions, combined with the system’s heavy rainfall, caused rivers to rise rapidly. Rivers crested at levels never seen before and, in some cases, that haven’t been seen since. Agnes’ water levels remain the highest on record for several sites, including the Chemung River at Elmira, NY (crested at 25.20 feet, more than double flood stage), the Susquehanna River at Harrisburg, PA (crested at 33.27 feet, more than 16 feet above flood stage), the Genesee River at Portageville, NY (crested at 33.25 feet, more than 16 feet above flood stage), and the Schuylkill River at Pottstown, PA (crested at 29.97 feet, nearly 9 feet above its previous highest crest). Flooding in Corning, NY. Credit: National Weather Service Binghamton. Flooding in Elmira, NY. Credit: National Weather Service Binghamton. Devastating flooding resulted, especially in the Susquehanna River Basin. 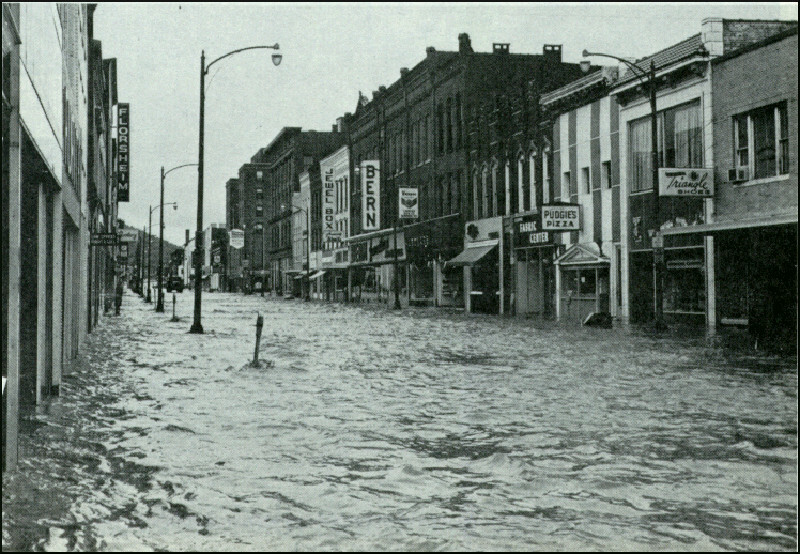 Levees failed or were topped in places such as Wilkes-Barre, Corning, and Elmira. Cities and towns were under feet of water. Hundreds of thousands of people either lost their homes or were without services such as water or electricity. 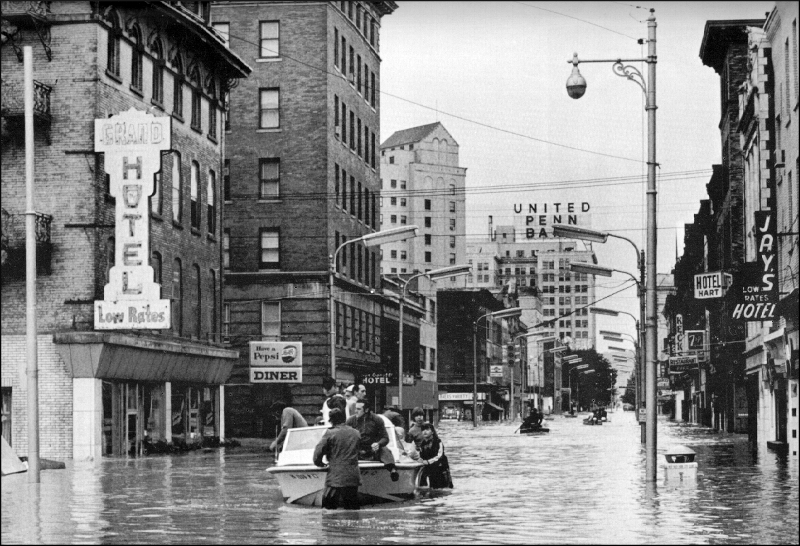 Tens of thousands of homes and buildings were flooded and hundreds of roads, bridges, and railroads were damaged or washed away. There were 48 fatalities in Pennsylvania and 24 fatalities in New York. The name Agnes was retired after the flooding event of 1972. Flooding in Wilkes-Barre, PA. Credit: National Weather Service Binghamton. Damage at the Pennsylvania Geological Society in Harrisburg, PA. “One end of the library showing havoc among the photo files. 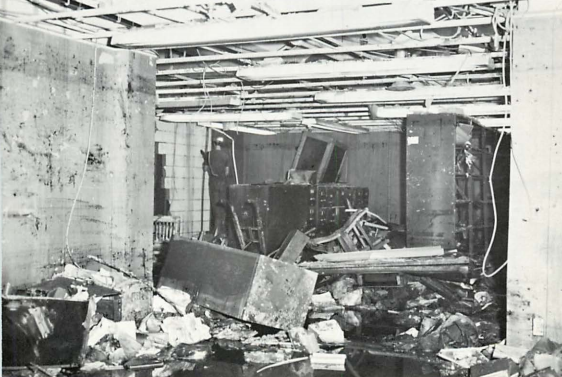 Water level higher than the ceiling dissolved the tiles, leaving exposed the struts of the suspended ceiling.” Credit: Pennsylvania Geological Society.